I don’t know what to think about House Crows anymore. They have become the cockroaches of birds. But it isn’t indicative of their statuses as unpleasant vermin. It just reflects my biases about certain creatures based on personal experiences. I have always been katsaridaphobic. The reason being that cockroaches go out of their way to strike fear in my heart. They have charged me on several occasions. Maybe it’s all in my head. But I believe that cockroaches attack me without provocation. Especially those with wings. It’s like they can smell my fear and they want more of it. Lately, I have begun to think that I might be corvidophobic too. I blame it on almost having my eyes plucked out on a few occasions. House Crows or Grey-Necked Crows have constantly picked on me. They have even harassed me on terraces of buildings I have worked in. They whiz past my ears from different directions, with malice. Even on my terrace at home, they threaten me They don’t leave me alone for five seconds when I am up there. They might be protective and territorial. But why aren’t they bothering my neighbours? Why do they think that I alone put them in clear and present danger? I can’t hate them. House Crows play a vital role in urban societies. Their roles as garbage disposers and unpaid pest removal squads can’t be ignored. Plus they are really intelligent. Their scientific second name – Splendens, in Latin, means “brilliant”. Many have documented their behaviour to prove that they are. I don’t love them either. 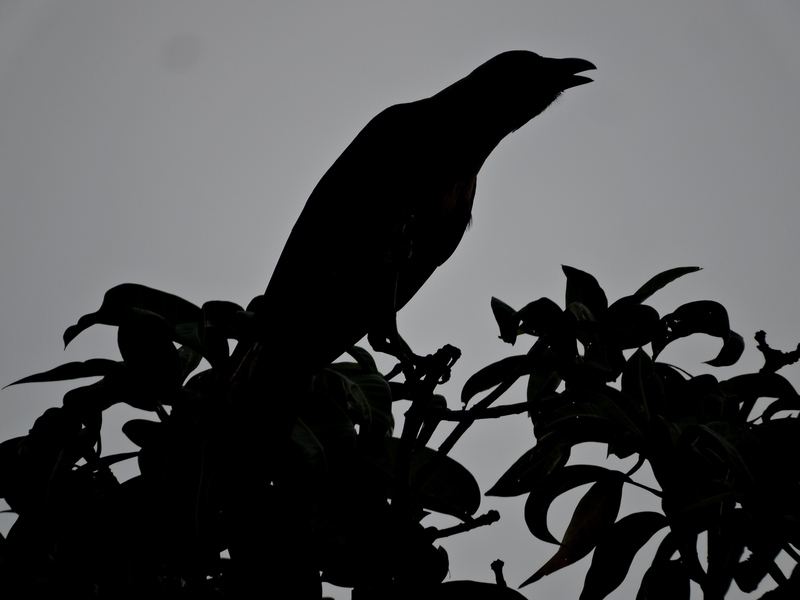 The Indian House Crows have become an invasive species. They ruthlessly invade, not just to sustain their lineage but to prove their dominance too. Plus, they can be bullies. They have even started wreaking havoc in Mombasa – a coastal city in Kenya. Only one other invasive species that I know of that possesses similar traits. But it walks on two legs. It goes out of the way to screw things up in Africa . And doesn’t realize how much noisy, intrusive and aggressive it is. Fool me twice and it’s on me. and all its petty rules. Christy, Have you seen this video from the BBC… https://www.youtube.com/watch?v=AVaITA7eBZE Kind of 21st century version of the old crow and the water jug story. But amazing! Woaw, haven’t seen this one before. Spellbound! Thanks TP. “Now there’s only one other species that I know of that possesses these traits. I am not very fond of them either.” lol Makes the story! Lol, what a “timely” post. I was thinking about this recently and in fact been thinking about this for quite some time. Years ago crows used to fly at a safe height, these days they fly so low that they can take the head off. Probably they evolved and learnt over decades. Think “Selfish Genes”. Selfish genes! But of course, nice comparison. I wonder what the next step in evolution is. Would be a rib tickler if they started stealing cups and saucers. It would freak us out thinking what they were up to! Crows are nasty, C. I told you about that one time when they left a ‘present’ (dead) for me on the balcony railing, right? Umm…do not anger them. Hahaha present indeed. Actually cats do that too for their owners and it’s like a gift or something. Hmm. Caw caw! I cawn’t see why not D (yeah sorry). And yaaaaaaay! Oh wow, that last line really hit home hard. Glad I gave you the shivers, lass hehe thank you! And I have heard of this theory which states that crows – like elephants – hold a grudge and look for revenge. Maybe I had done something to them as a child and our respective lineages have crossed paths again! You are right about “murder of crows” sounding the best!What are zebras called in this regard? And Zebras are often referred to as a ‘dazzle’ of Zebras, haha. Oh wow. A wisp of snipes is officially my new favourite! I think the reason most people hate crows is because they are black. I kind of like the em though… They’re such simpletons… And cuckoos (or is it some other bird?) take advantage of that – what can be more ruthless than killing he crow’s young one and making them hatch the eggs of another bird. Apart from their intelligence, its perhaps this concept of crows being representatives of our ancestors that I have grown up around that makes me like them. “I think the reason most people hate crows is because they are black” – Yes yes and yes! You make a good point about them being simpletons, but I wonder if the Asian Koel (the lady who lays her eggs in crows’ nests) is just dastardly clever and the crow – just a good mother (smile). Tell me about them being representatives of our ancestors, I haven’t heard that one! Every year, my mother and I say this prayer in the early hours of the day after pongal. Leftover sweet and salt pongal, along with other dishes are served on a platter specifically for crows, and they are invited to eat. Not just during pongal, but we are supposed to serve rice to crows everyday before we eat… Although it’s the other birds who finish it off! PS: my Tamil isn’t very good. Oh! I never realised that’s why people leave the leftovers for them. My neighbour does that all the time but often they are ransacked by Mynas hehe. As Cara mentioned above, crows are a very tight family unit! See — the crow’s food also gets stolen! Yay, another underappreciated bird!! I treat crows as my “friends” because it’s just fun to make cawing sounds at them and hear them respond. They’re actually really smart birds! Lovely to hear that! I hope to see them on your blog soon, dear friend! Very good and entertaining writing. Thanks. Yes,you’d almost think they think they’re human. I hate seeing crows bully smaller birds at our feeders. I hate enduring cowbird ‘flybys’ when they think I’m encroaching on their territory. And it’s almost too much to take when someone reminds me they’re very smart birds. Doesn’t seem very smart to me. I loved the post! Perfectly summarised Elouise. It’s the bullying that I can’t seem to understand. I often wonder if I am misreading them. Thank you for dropping by, it’s always a pleasure! They are associated closely with the afterlife, aren’t they? Or perhaps those are Ravens? I remember them as such from works of Edgar Allen Poe and Neil Gaiman. Fiercer foe indeed, my friend. These are very clever birds. I have read that ravens can be taught to speak basic human language. It’s really a nice read Christy. I sometimes wonder if intelligence is more frightening than we think of it! But yes, very clever fellas. I used to dislike crows intensely (though ours are not quite the same as yours) but in the past year and a bit have become fond of a couple of them, in particular one which I’ve just written about in my blog. This isn’t to say I trust them all, but as I tend to think of birds as being not too different from humans, there are many humans I wouldn’t automatically trust (or distrust) either! And – are there not beliefs, superstition sand mythologies, in many religions, about crows? Some that claim they are harbingers of doom and others that claim the opposite? My thought is they must all be based on something in the birds’ actual natures. You know, now that I think of it. I may have thrown stones at a crow’s nest when I was a kid. I remember the sight of spilled yolk, and a lot of guilt. Gosh, that’s putting things into perspective eh. Thank you, Val. You bring wonderful perspectives to the silliness that goes on in my head, at times. You’re the best. Great read too, the NY article.